It's another sale as news arrives from Sunseeker London that their joint listing with Viare, the 33.91m motor yacht Arabella II is sold. 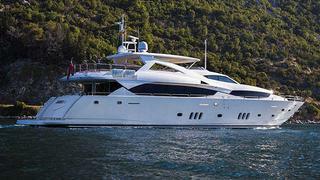 She's a stunning version of the Sunseeker 34m yacht from 2009, and she is powered by twin MTU M93 16v engines. Boasting a comprehensive specification that includes Trac Digital Fin stabilisers, electric opening GRP hard top, B&O audio/visuals throughout, Arabella II also features a hydraulic bathing platform and a large tender in her aft garage. Accommodation is for 10 guests in a master suite, two double staterooms and two twin cabins. Arabella II was asking €6.2 million.